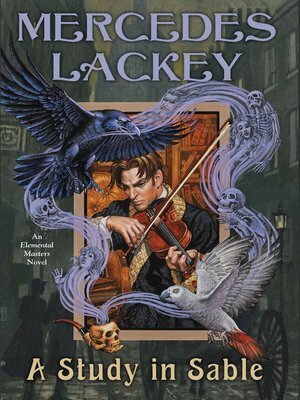 Introducing Sherlock Holmes and John Watson to the magical early 20th century London of Mercedes Lackey's Elemental Masters series! Psychic Nan Killian and Medium Sarah Lyon-White—along with their clever birds, the raven Neville and the parrot Grey—have been agents of Lord Alderscroft, the Elemental Fire Master known as the Wizard of London, since leaving school. Now, Lord Alderscroft assigns them another commission: to work with the famous man living at 221 Baker Street—but not the one in flat B. They are to assist the man living in flat C. Dr. John Watson and his wife Mary, themselves Elemental Masters of Water and Air, take the occult cases John's more famous friend disdains, and they will need every skill the girls and their birds can muster! Nan and Sarah's first task: to confront and eliminate the mysterious and deadly entity that nearly killed them as children: the infamous Haunt of Number 10 Berkeley Square. But the next task divides the girls for the first time since they were children. A German opera star begs Sarah for help, seeking a Medium's aid against not just a single spirit, but a multitude. As Sarah becomes more deeply entwined with the Prima Donna, Nan continues to assist John and Mary Watson alone, only to discover that Sarah's case is far more sinister than it seems. It threatens to destroy not only a lifelong friendship, but much, much more.